One of my favourite cushions is being featured on the UK Handmade Summer Showcase. 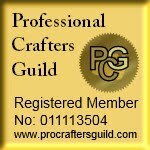 This is a great site for anyone who is a maker, it has interesting articles as well as a forum where you can post your your makes. The showcase allows makers to be featured and will be promoted by UK Handmade so fingers crossed I get some new followers and may be some sales.